Gun Drilling & BTA Drilling: These are the right tools when you absolutely positively have to drill a hole as deep as possible. “Deep” is defined by drill diameters. While we can use special g-code such as the Conversational Programming of G-Wizard Editor to extend the reach beyond Parabolic Flute Drills and Peck Drilling, to go really deep takes even more specialized tooling. Typically, Gun Drilling and BTA Drilling are done on special deep hole drilling machines that are designed for the purpose. Such machines are capable of contra-rotating both the cutting tool (Gun Drill or BTA Drill) and the workpiece, which gives the best results. Gun drilling can also be done on a lathe, but the disadvantage is that the lathe can only rotate the workpiece and not the gun drill at the same time. Gun Drilling got the name because it was originally created to help make straighter more accurate gun barrels. Hole depths are greater than 20x. Holes would require reaming or honing to meet tolerances. Gun drilling requires no reaming or honing. With diameters of less than 20mm. 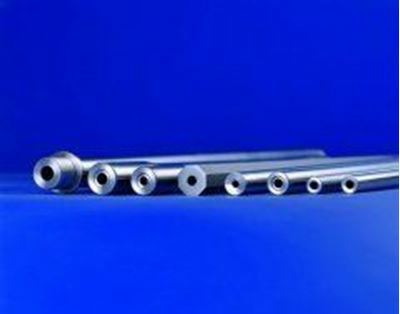 Larger diameters can be done more efficiently with BTA Drililng. Sometimes even relatively shallow holes (by gun drill standards) benefit from gun drilling when straightness, diameter, and surface finish requirements are high. The hole size, finish, and straightness of a gun drilled hole are all higher than with twist drilling, so eliminate a second reaming or honing op via gun drilling may save time. While gun drilling can be done on a lathe, it is better done on a special-purpose deep hole drilling machine. The advantages of the deep hole drilling machine include the ability to rotate both workpiece and gun drill (in opposite directions), whip guides to support the long drill and workpice, plus high pressure coolant for better chip evacuation. Contra-rotating tool and workpiece contributes to straighter holes. Dedicated deep hole drilling machines also have more sophisticating monitoring of loads and coolant pressures that correctly identify when the tool is dulling and needs to be changed. Anthony Fettig, CEO of UNISIG, says the dividing line is at about a 40:1 diameter ratio. That’s the point where purpose-built deep hole drilling machines start to have a significant performance advantage over using gun drills on conventional lathes and milling centers. 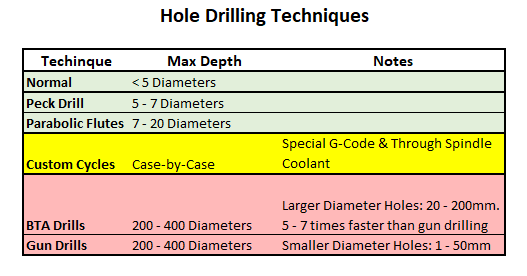 Create a pilot hole at least 1 to 2 diameters deep and 0.0005 – 0.001″ larger than the gun drill. Position the gun drill in the hole before starting rotation. Always stop rotation before removing the gun drill from the hole. 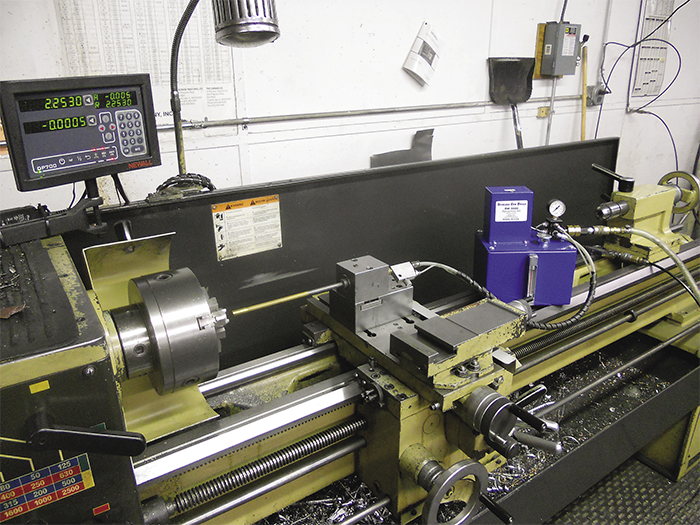 Consider a steady rest on the lathe to help stabilize gun drills. If you don’t have a steady rest, you may have to use a series of progressively longer gun drills. Try to keep less than 40 diameters of gun drill unsupported. 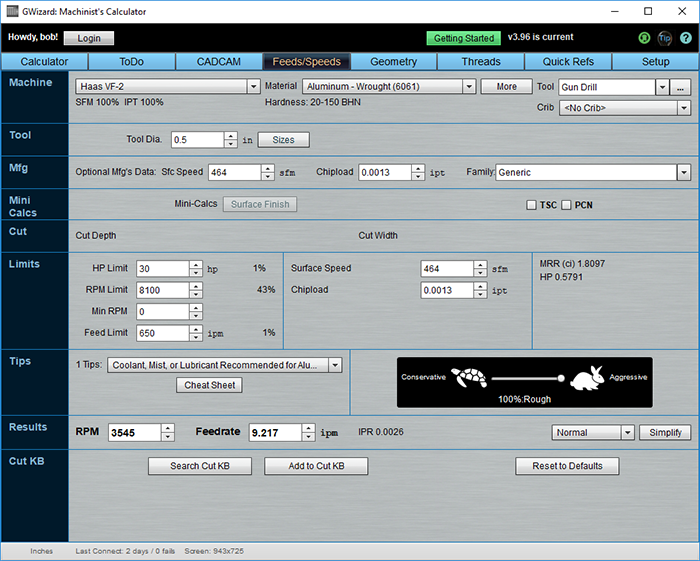 When using mist instead of high pressure coolant, reduce feedrates by 60%. The smaller the hole, the more important higher pressure coolant becomes. Gun Drills are happier with cutting oil than typical water soluble coolant used with CNC. Keep the coolant temps below 80 degrees F so you don’t lose viscosity on the oil. Another area to fine tune for your particular application is the nose grind or geometry. If not specified, most gun drills have a N-8 nose grind and R1 relief. This is fine for steel or inconel. But, in the case of aluminum or brass, you’re better off with an N-4 nose grind and R4 relief. Consult your gun drill manufacturer for best results as they’re the experts. BTA Drilling involves a drill bit mounted on a long tube. Chips are evacuated through the center of the tube and coolant flows around the outside of the tube, which is a smaller diameter than the hole. BTA cutters are either brazed or inserted carbide. BTA stands for Boring and Trepanning Association. BTA Drilling can achieve feedrates that are 5-7 times that of Gun Drilling, hence it can be a lot faster. The downside is the tool is bulkier, so it can only be used on larger diameter holes. Deep Hole Drilling is a process many shops outsource, particularly when there is a need for BTA Drilling or the kind of very deep holes where dedicated deep hole drilling machinery really shines. However, if your deep hole needs can be handled with a gun drill on a lathe competitively, it’s not that hard to bring the process in-house.